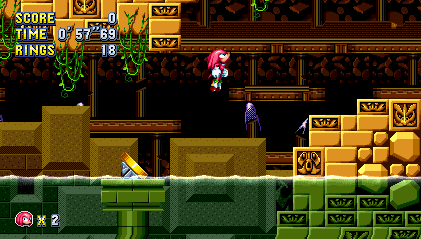 This is a Mania-style mod - act 1 is faithful to the original level, with a few new bits here and there. 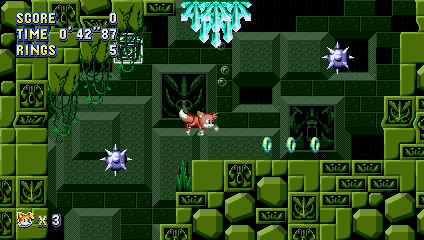 Act 2 is a near total overhaul, with new artwork, gimmicks, and level design (and a few exclusive paths). Definitely deserve some more comments here; you did a splendid job giving Labyrinth the Mania treatment. I don't have Mania on PC myself to try out mods, but from the footage I've seen, it looks very fun! To add, the soundtrack is top notch. This mod may make me download the mod manager and try it out. Videos have been fantastic. This look really cool, I'll try it out ASAP and edit my post with my impressions. My impressions : Act 1 was great, Act 2... not so much. It started out good, but quickly fell into trial and error territory, which is something a Sonic level should never, ever do. 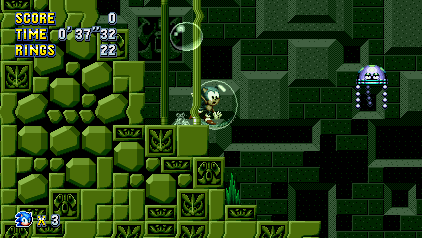 The part where you have to navigate the bubble with the propellers (with no ring near the checkpoint ), and the part with the vines and the bottomless pit should be scrapped entirely imo.